With much in the news lately about digital media companies, their roles in our society, and the extent to which they should be regulated, this month we examine some of the astounding numbers and trends in digital media. It is obvious that digital media and video entertainment is ubiquitous in our daily lives, but the scale of saturation and rate of growth can be difficult to grasp until you see the data. Let’s start with the overview, and it is troubling but not unexpected. According to Nielson, the average American adult spends over 11 hours per day consuming media, almost 10 hours of it through a screen. And it is important to realize that this screen time number doesn’t include time spent performing work or school functions on a computer. 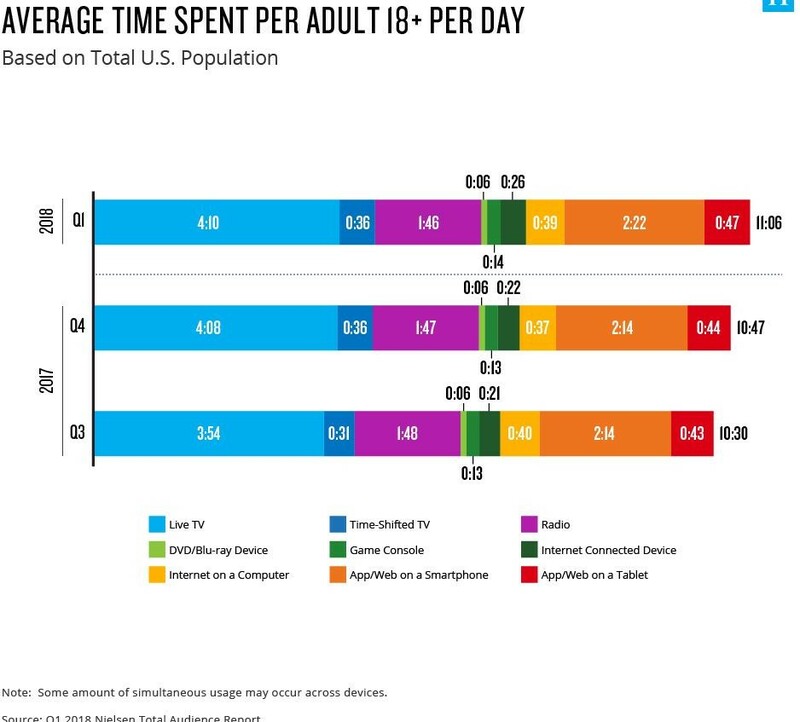 This translates to spending almost 75% of our waking hours consuming media in some form, making it by far the dominant activity in the daily life of an Average American. The largest growth area of media consumption is in the App/Web on a smartphone category. Breaking down the consumption by age group, we can see that the trend is clearly toward digital and away from traditional broadcast television. Only 26% of media consumed by the 18-34 age group is done through live or recorded television, while almost 30% is consumed on a smartphone. 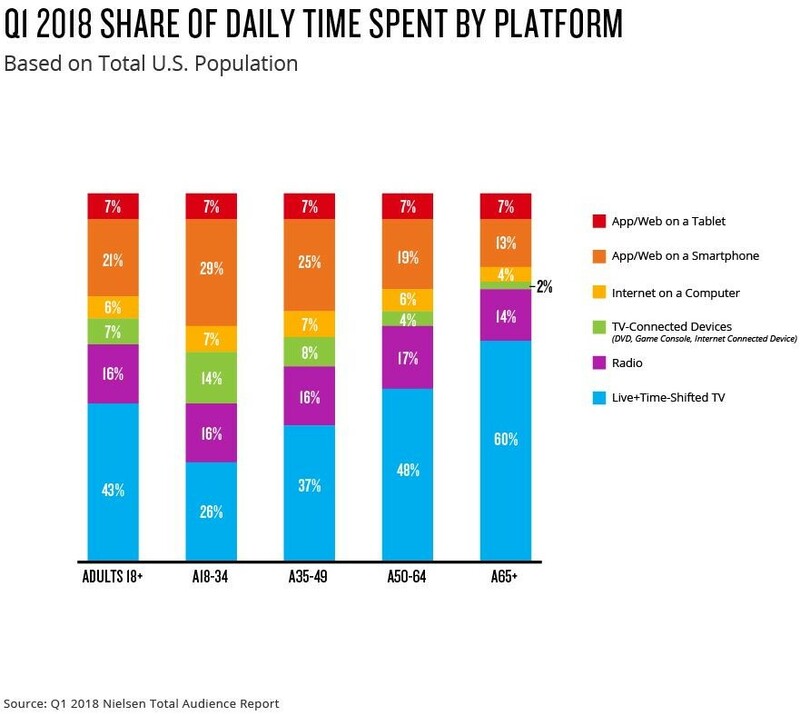 An interesting aspect of this chart is the consistency with which radio is represented across age groups, suggesting some staying power for the oldest of the media platforms, likely due to time spent in the car. It is obvious that live TV will continue to shrink as a percentage of media consumption market share as the 18-34 age group consumes less than half of the media through TV than the 65+ group does. 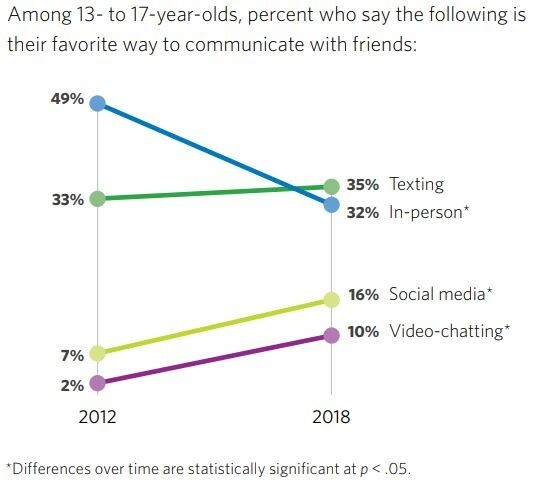 These trends are not surprising, considering the almost total adoption of smartphones in the developed world over the last five years. It may seem from the perspective of the US that smartphones are old news, but the rest of the world has rapidly caught up from 2012-2017. 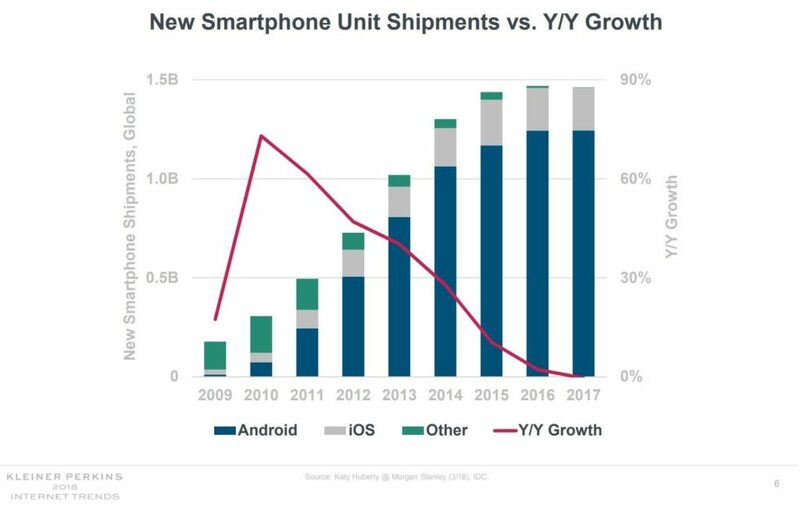 While growth rates have leveled off, we are shipping about 1.5B new smartphones annually worldwide. With Wi-Fi and 4G networks capable of streaming video now present in almost all the world’s metropolitan areas, the accessibility of video on a handheld device makes it far less likely for a consumer to wait until they are home to consume their media. 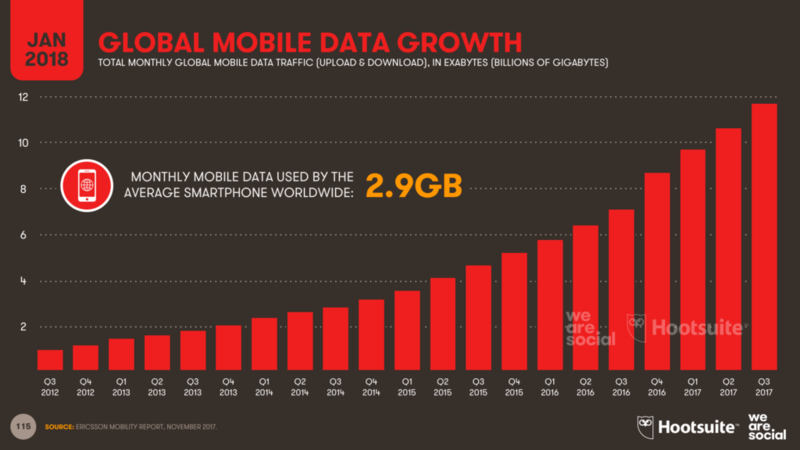 The truly astounding growth in mobile data consumption confirms the survey data, with over 40 billion gigabytes of mobile data traffic in 2017 alone. But as many parents know, the growth of this new(er) form of interaction is not without trouble. 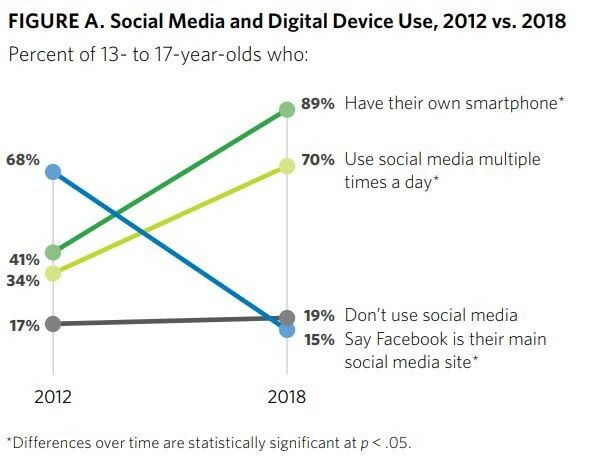 In just 6 years, the percentage of 13-17 year old’s who have their own smartphone went from 41% to 89%, with the percentage of those who use social media ‘multiple times a day’ growing from just 34% to 70%. This is where our children are spending the majority of their free time, the consequences of which have yet to be fully understand or borne out as they grow in to adults. The continuation of these trends will have drastic effects on the marketing, branding, and outreach strategies across virtually every industry. Should these preferences remain as younger generations enter the marketplace and the workforce, they will demand an availability of digital interaction in everything from financial services to medicine to education. The successful companies of the 2020’s will be those that can effectively reach consumers through video and mobile content, while providing their services and allowing access to products digitally.